Two hundred thirty one years ago today a small naval battle occurred off the coast of Yorkshire England. From a purely military perspective the battle was rather insignificant. A squadron of five American and French ships intercepted a convoy guarded by two British ships. However, the battle was one that had immense psychological significance for the Americans as a ramshackle converted French East India ship with an inferior main battery forced a materially superior British warship to strike her colors. 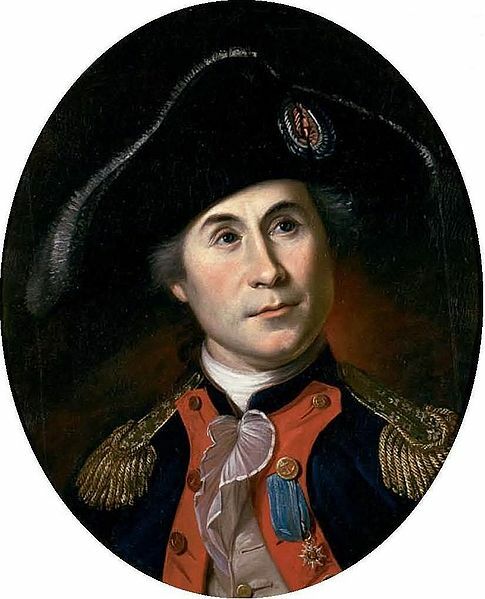 In fact the battle is so significant to the United States Navy that the body of the victor, Captain John Paul Jones was returned to the United States in 1905 from an abandoned site in northeastern Paris known as the former St. Louis Cemetery for Alien Protestants to be interred in Bancroft Hall at the United States Naval Academy. Jones had an unusual career as a British merchant skipper accused of murdering a mutinous crewman at Tobago and escaped to Fredericksburg Virginia out of fear that he would be tried in a local versus and Admiralty Court. Jones went to the United States and due to his friendship with Henry “Lighthorse” Lee and other friends in the Continental Congress including a man who became a lifelong friend, Benjamin Franklin obtained a commission in the Continental Navy as a First Lieutenant. At that time the “First Lieutenant” was the senior officer among the Lieutenants on a ship and often served as the First Officer or Executive Officer. His first assignment was on the fleet flagship Alfred where he hoisted the first US Ensign aboard an American Naval vessel. He took part in the raid on Nassau and upon his return assumed command of the Sloop of War Providence where he captured 16 prizes of war and escaped capture by the a British Frigate. He then assumed command of Alfred for a brief time capturing a key supply vessel that had winter clothing for British troops commanded by General Burgoyne in New York. 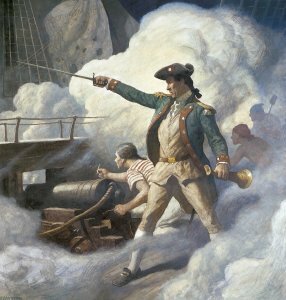 Following this he took command of the 18 gun Sloop of War Ranger in France received the first ever salute to an American man-of-war by a foreign power 8 days after the French had recognized the American Colonies as an independent nation. The nine-gun salute fired from Admiral Piquet’s flagship recognized this and the new Franco-American alliance. 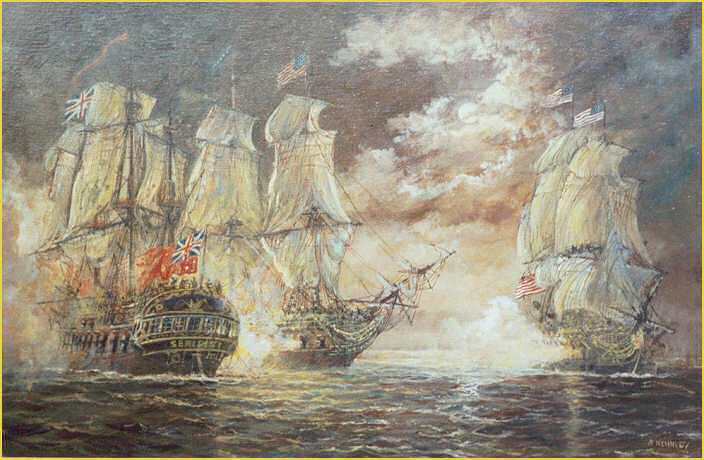 Jones wrote of the event: “I accepted his offer all the more for after all it was a recognition of our independence and in the nation.” After this made an epic raid on the port of Whithaven and captured the British 20 gun Brig HMS Drake in an hour long fight. Jones’ raid on Whithaven struck fear into the British populace and forced the British to allocate more resources to the defense of British seaports than had previously been the case. 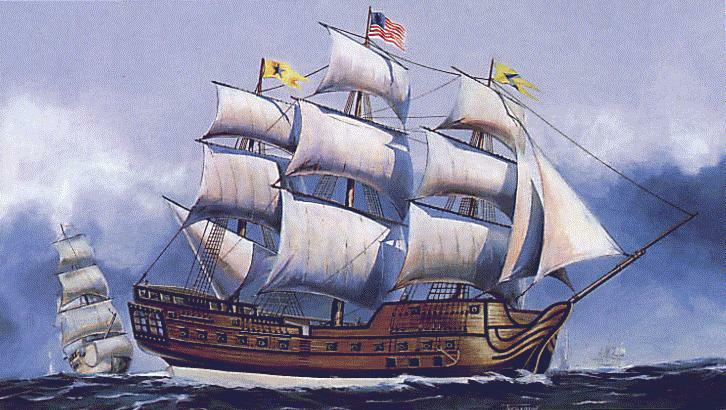 The capture of the Drake was of immense psychological importance and along with Jones’ other victories would ultimately lead to the formation of the United States Navy. Jones’ exploits made him a celebrated figure and after giving up command of Ranger took command of the Bonhomme Richard a converted 42 gun former French East India ship named after Benjamin Franklin’s book “Poor Richards’ Almanac” and a mixed squadron of American and French ships including the 36 gun American Frigate Alliance, the 32 gun French Frigate Pallas and two 12 gun warships the Vengeance and Le Cerf. Detailed to provide a diversion for a combined French and Spanish fleet the squadron menaced Ireland and Scotland before moving into the North Sea. As they came into English waters the Americans intercepted a 50 ship convoy on the 22nd of September. The convoy which was enroute to the Baltic was escorted by the 44 gun two-decker Serapis. Serapis was brand new and powerful in comparison with Bonhomme Richard though a larger ship was not designed as a warship nor had as powerful battery as Serapis. A second ship, the 20 gun Countess of Scarborough accompanied Serapis. Serapis then collided with Bonhomme Richard and in his attempt to extricate his ship from the American Captain Pearson ended up causing the ships to come side to side and Jones’ crew lashed the ships together. The fight now became a close quarter fight with the remaining guns on both ships blasting large holes in the other at point blank range while Marines in the rigging poured relentless musket fire and grenade volleys on the exposed crews of their opponents. An American grenade thrower was able to drop a grenade down an open hatch of Serapis where it exploded near a charge of gunpowder placed in readiness setting off a chain reaction of explosions which knocked out five guns and killed or wounded most of the gun crews. 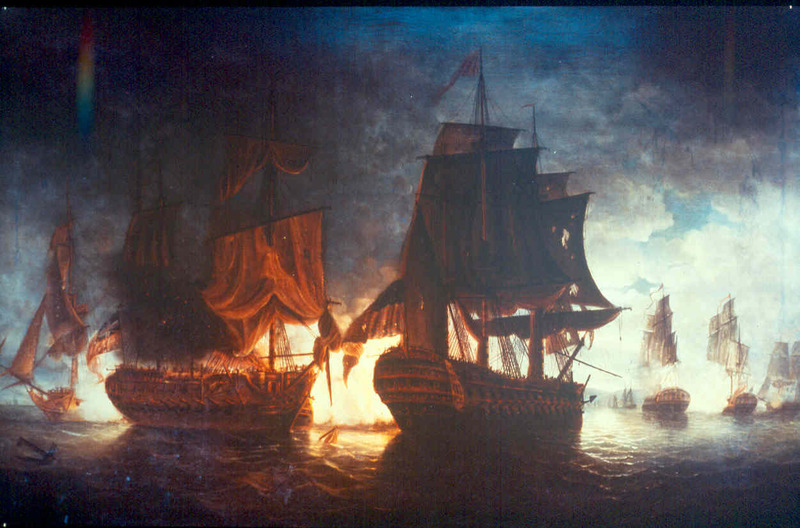 Bonhomme Richard had taken a severe beating with most of her guns knocked out, taking water and burning from fires ignited by the British onslaught. The Bonhomme Richard’s Carpenter and Master of Arms thinking that Jones was dead took it on themselves to hail the British to say that the Americans had struck their colors, which had been shot away in the engagement. Pearson hailed Jones asking of he had really struck and Jones responded “I have not yet thought of it, but I am determined to make you strike.” The battle continued and the Alliance under the command of a Frenchman with an American commission Pierre Landais came up and delivered a devastating broadside much of which hit Bonhomme Richard, holing her again below the waterline and causing her to settle rapidly. At the same time she caused additional damage to Serapis. With his ship badly damaged and Alliance threatening Pearson stuck his colors in person at 2230 hours. Jones would take possession of Serapis and the badly damaged Bonhomme Richard would sink the on the 25th of September despite Jones’ best efforts to save her. Jones made temporary repairs Serapis and sought refuge in the Netherlands. The battle was militarily insignificant but again a major psychological victory as Jones had for the second time defeated a British warship in British waters within sight of the local population. Even though Jones had taken Serapis the British warships completed their mission of protecting the convoy. Jones’s post war career would leave him embittered. His opportunity to command the first US Navy Ship of the Line, the 74 gun America disappeared when that ship was given to France. Made a Chevalier of France by Louis the XVI and awarded a gold medal by Congress Jones found employment in the Imperial Russian Navy of Catherine the Great. Though successful against the Turks jealous Russian commanders conspired against him and had him removed from his command of the Black Sea Fleet. He retired to France where he died of a brain tumor on July 18th 1792. The odds against Jones in his battle with Serapis were heavily weighted against him. 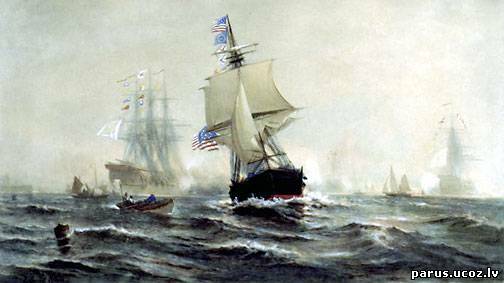 His victory over Serapis was another demonstration that the Americans should not be taken lightly and began a tradition of valiant service for the Navy that has endured throughout the centuries. The victory off Flamborough Head reaches into the present as American sailors and their ships ply the world’s oceans keeping the sea lanes open and protecting American interests abroad.